The new flagship device will feature top-tier specs, a nano-SIM card, and oddly placed volume controls. 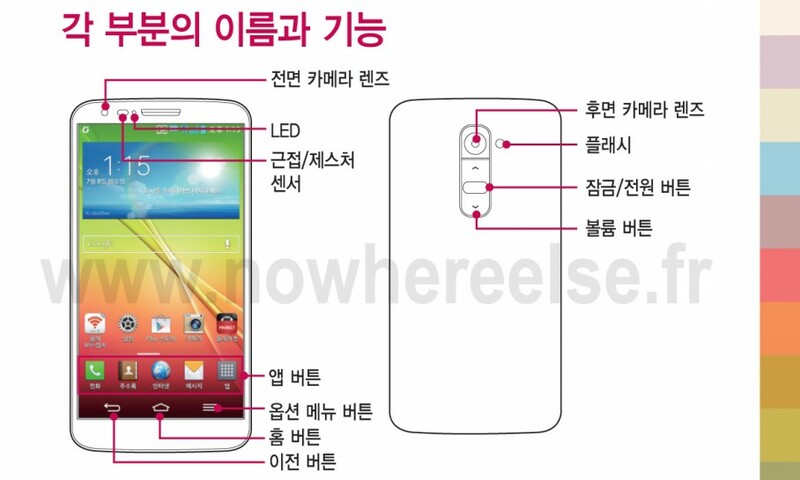 While it's not scheduled to be officially released until August 14th, the French website nowhereelse.fr has posted what appears to be a leaked copy of the LG G2's user manual. The manual seems to confirm previous rumors that the G2 will feature a 5.2-inch 1920 x 1080 display, a 2.3 GHz quad-core Qualcomm Snapdragon S800 processor, Adreno 330 graphics, 2 GB RAM, a 13 MP main camera, and a 2.1 MP front-facing camera. Today's leak does give us a little more information to fill in the gaps though, and goes on to show that the G2 will use a nano-SIM card and supplement its 32 GB of internal memory with a microSD slot (up to 64 GB cards). Run time should also be solid on the new device, with a 2610 mAh removable battery. One of the G2's more unusual features are its volume controls, which are located on the back face of the device under the camera. The button that is located between the volume controls sparked a lot of discussion after the first images of the smartphone were leaked. It turns out this is only a power/lock button and not a fingerprint scanner as some had hoped. The new gadget will measure 138.5 x 70.9 x 8.9 mm (5.4 x 2.8 x 0.35 inches) and weigh 143 g (5 ounces). For prices and availability, we'll have to wait for LG's official announcement next week.